Workers unite to try and take control of their ship yard in Sting's very Sting-like new musical, "The Last Ship," now open at the Neil Simon Theatre. Submerged beneath an often told prodigal-son story is a haunting, gorgeously executed and involving musical that marks the debut of a new Broadway composer—Sting. The British songwriter was inspired by his own childhood in writing “The Last Ship,” about a group of U.K. ship builders whose livelihoods are threatened by the changing global market, in a time that evokes the 1980s. The musical, directed by Joe Mantello and burnished by Steven Hoggett’s foot-stomping choreography—Hoggett’s “Once” is one of many recent musicals “The Last Ship” calls to mind—has just opened at the Neil Simon Theatre. Sting, as so many of us know, grew up Gordon Sumner in Newcastle’s seafaring Wallsend district. In “The Last Ship,” Gideon Fletcher (Michael Esper, of “American Idiot”) abandons that same community as a young man, rather than don the ship-builder’s boots his father has in waiting. When Gideon gets word from the town priest (a potty-mouthed Fred Applegate, getting all the best lines) that his dad is dying, he returns home, to find the Swan Hunter yard’s future in danger and his childhood love engaged to another man. It’s a familiar story that in lesser hands would quickly wobble under its weight. As it happens, a great cast, led by Esper and Rachel Tucker (a one-time West End Elphaba, in “Wicked”) as Meg, that one-time love, prevent that from transpiring. It’s bracing to see Esper in a more adult, even paternal role, and it’s one he pulls off with charisma. That Esper’s Gideon must somehow make peace with his past, the abusive father and so on, is a foregone conclusion, but his methods of doing so struck me as exceedingly honest. What I said about Esper aging into his role goes double for Aaron Lazar, who I still remember as young heartthrob Fabrizio in “The Light in the Piazza.” He’s endearing, here, as Arthur Millburn, Meg’s fiance and the third side of the Gideon-Meg love triangle. Arthur worked his way out of the ship yards into a secure corporate life, but he’s never played for the villain, which was yet one more way “The Last Ship” surprised me. 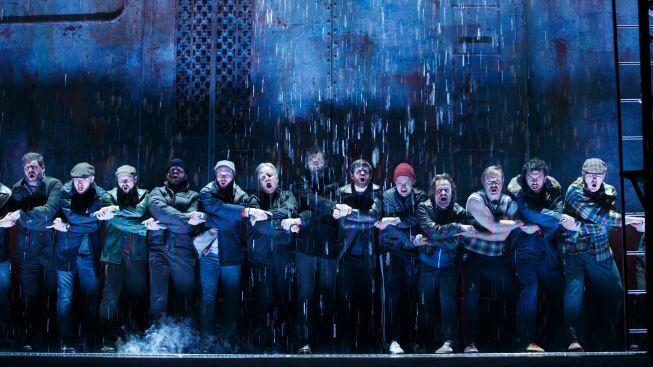 It’s impossible to watch “The Last Ship” without thinking of the paperboys in “Newsies,” the coal miners in “Billy Elliott” or the unemployed steelworkers of “The Full Monty.” Nothing here is quite as earnest, or played for laughs. The tone, not surprisingly, is all rather Sting-like: Ethereal. Spiritual. Universal. David Zinn’s industrial set transforms in the musical’s final scene to produce a lump-in-the-throat moment that managed to catch me by surprise. There are so many cliches and potential pitfalls in this story that I went into “The Last Ship” with low expectations: The boy trying to escape his father’s shadow. The second chance, will they-or-won’t-they romance with the girl from his past. I had every reason to think “The Last Ship” would take on water. It doesn’t. This boat floats. “The Last Ship,” with an open-ended run at the Neil Simon Theatre, 250 W. 52nd St., Tickets: $68.75-$146.75. Ticketmaster.com, or 800-745-300.